Sculpture Size: 3.25 X 2.25 X 1 in. "Zen" is about as small as his name! Fits perfectly in the palm of your hand. 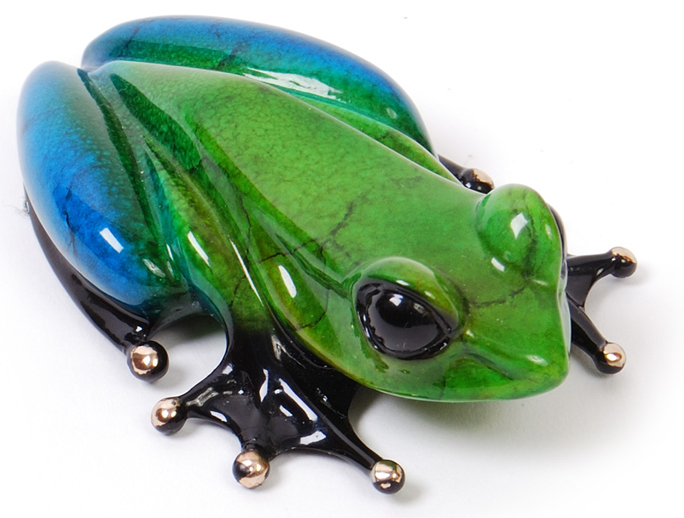 This little frog packs a big punch of color and personality. "Frogs have fascinated me since my childhood in the fields and woods of the English countryside," says Tim Cotterill. "As a boy, I studied the movements of frogs and planned strategies for catching them. As an adult, I am intrigued by their stillness and watchfullness as they conserve movement for just the right time to make their leap for a catch. I call this piece "Zen" because of his still, watchful pose." Looking for unique one of a kind display ideas? "Zen" fits on a Medium Glass Lily Pad. See Display Accessories Section.